Layli Long Soldier’s kind articulate dance of linear dimensions and tonal inflections enfold and expound difference. As a child, Long Soldier delivers, “sound was a conduit for emotion, the purest.” Her parallel passion discovered writing. She says, “There was an articulation in writing that I couldn’t achieve through music, so for me, the two disciplines were almost like left and right hands. My right hand was music, what I reached out with the most. But writing, on the left, was the silent do-er; picking up little words and phrases, tinkering, twirling, investigating.” The playful curiosity of language could be summarized in a favorite poem by Saroyan. She explains, “It’s just two black words in the middle of a white page: “I crazy” I read that and I was like, Yes, man, you crazy. And I love it.” Transcendence from this delightful infraction of left and right presents an intelligibly complex simplicity that breathes the stillness, dresses the poem as body on the page, and delicately brews each moment with an explicatory amount of energy. 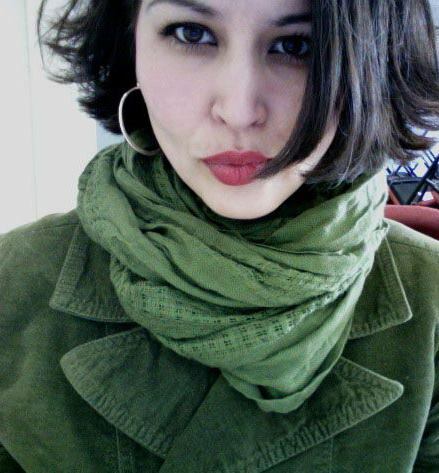 Layli Long Soldier holds a BFA in creative writing from the Institute of American Indian Arts and is currently pursuing her MFA at Bard College. She resides in Tsaile, AZ on the Navajo Nation with her husband and daughter and is an adjunct faculty member at Diné College. Her first chapbook of poetry is titled, Chromosomory (Q Ave Press, 2010). 1.) What were the first inspirations that made you desire to become a writer? The oddest thing is, even as I studied creative writing in college, I didn’t have my sights set on being a writer as a professional title or as an identity. It didn’t appeal to me as something to strive for, for whatever reason. And I’m not being coy. When I was younger, I wanted to be a musician. More specifically, a singer. I think Georgia O’Keefe once declared the violin as the highestform of expression. After that, she said, comes singing. But since she couldn’t sing, she painted… or something along those lines. In my youth, there was nothing more powerful or magnificent than the human voice, what can be done with it; the act of singing, itself. It was perhaps the one thing I really aspired to. I also played electric guitar and bass—and when I was a girl, I played the violin and piano. My mom was trained as a pianist so picking up a musical instrument felt natural to me. Sound was a conduit for emotion, the purest. And it was in this vein that I felt most alive. However, I never really got anywhere with music. My singing was less than amazing and I’m not so sure I was all that talented, though the desire to play was there. Whatever the case, doors never really opened with music except for the occasional jam session or garage band experience. But on the side, in a very quiet way, I would write. Bad poems. Although my poems were magnificently bad, the practice of writing was necessary for me too. There was an articulation in writing that I couldn’t achieve through music, so for me, the two disciplines were almost like left and right hands. My right hand was music, what I reached out with the most. But writing, on the left, was the silent do-er; picking up little words and phrases, tinkering, twirling, investigating. Yes, so I entered creative writing studies with an interest in what could be done with my interest. Ha! But I never expected that this on-the-side interest would flourish as it has. It’s an endeavor I grew into and now, I must admit, provides a solid, deep joy. Perhaps this joy from writing is seated comfortably in my core because of the life lesson it’s provided—writing has shown me what happens with patience. Taking my time with a poem, I am always surprised by what can tip itself into existence through language (the most immaterial of art materials). The surprises I have experienced in my writing practice have dislodged me from curiosity into love. 2.) Who have been the creative inspiration / mentor writers in your career? To a large degree, peers, alumni and former professors from the Institute of American Indian Arts (IAIA). Some have graduated before me but I’ve had a supportive community of artists and writers who touch base every now and then… we often share/discuss certain artistic, literary or cultural concerns, we read each other’s work, sometimes offering critique, other times just solid encouragement. Somehow, and this may sound strange, but it feels like their voices are my voice. Meaning, I deeply care about what they are doing. And for the most part, it seems as if the feeling is mutual. For example, a few months ago I emailed my former IAIA professor, Jon Davis, some recent work. I asked him if he could look at my use of punctuation. I was working by intuition but unable to consciously deliberate. So we met one afternoon and when I arrived, his table was covered with poetry books and examples of non-traditional punctuation. We spent two hours discussing the comma. Who does that in ordinary life? It’s funny to me, and this is why I love poetry. There are also more established Native American writers who’ve been supportive, who message or drop a Facebook comment here and there—Joy Harjo, Luci Tapahanso, Laura Tohee, Susan Power. I devoured their works in undergrad, they were my first exposure to literature, really. They’re trailblazers. So I get fuzzy whenever they glance in my direction and their little nudges of support carry me a long way. But my circle of writing mentors and inspirations is always expanding. The Bard community of artists/writers also inspires me—my faculty and peers have helped me view the page differently, conceptually; sometimes as a soundscape, a canvas, sometimes a film. Outside of IAIA and Bard, I have made some really special contacts through workshops, readings and even Facebook. Email conversations or letters with poets, my friends, are some of the most treasured conversations of my life. 3.) How has your own work changed over time and why? When I first began writing poetry, I labored over small poems and cautious line breaks. Then I found prose blocks, which is still a form I really care for—the simultaneous constraint and freedom. 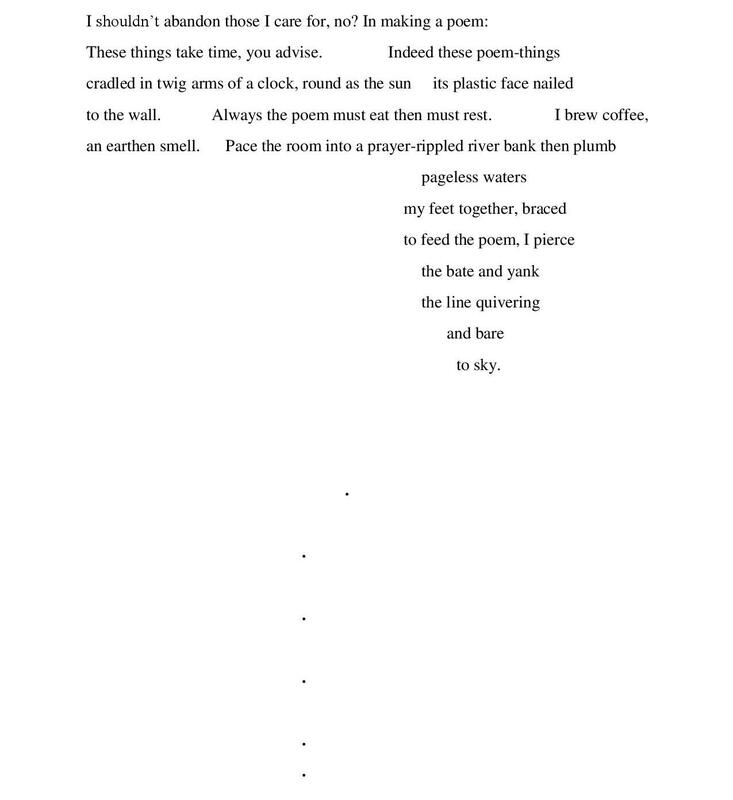 Some years ago, I took a course at Naropa’s Summer Writing Program with Akila Oliver and I discovered the long poem. I learned I could write one single poem and extend to its furthest outer limits, I could take it as far as I wanted and exhaust myself. How beautiful. Long poems allowed me to really explore and grow into a subject, to write in sections and experiment with form. 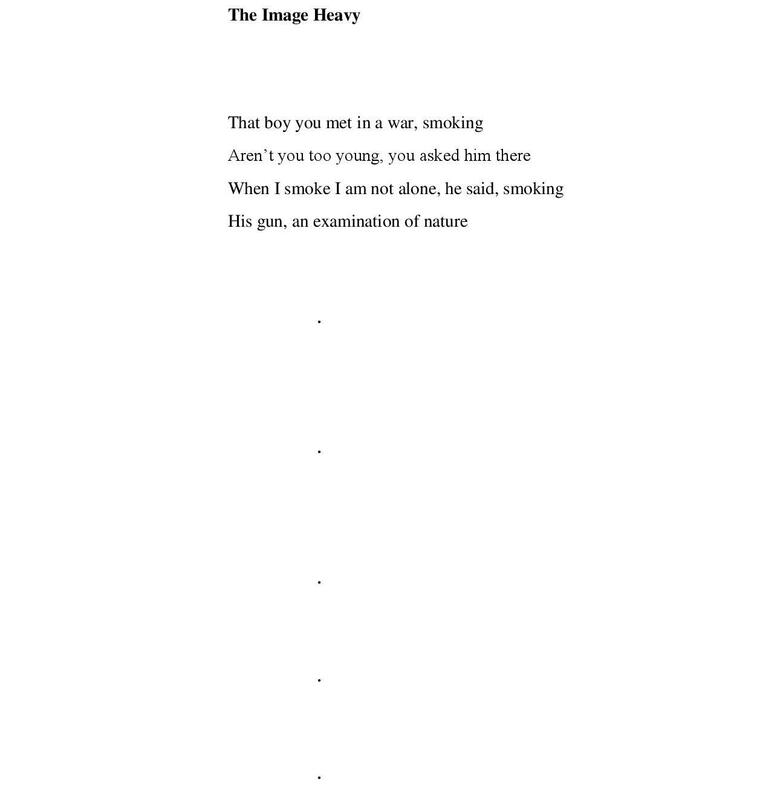 Now, I am less concerned with a single poem but am working on a series of 29 poems in response to one single document (the Congressional Resolution of Apology to Native Americans). Every few years my work seems to coalesce into some other working entity and functions differently. I like that, it keeps me interested. At the same time there are threads that remain the same, I can look back at my earliest attempts at writing—before undergrad, even—and I recognize small glimmers that eventually exploded into full-blown obsessions. My dictionary poems, for example. When I first began writing, I’d record definitions, phrases or odd uses of a word. This includes both English and Lakota language. I’d break the word down then particularize it into something else. These were not poems to me, at the time, but were tinkerings for amusement. Eventually, as I was exposed to more poetry, I realized this word play in my notebook was a lot funner to read and more enjoyable to write, so I allowed myself to loosen up. I put aside ideas of what a poem should be and focused more on the enjoyment, I wanted this to come through on the page. 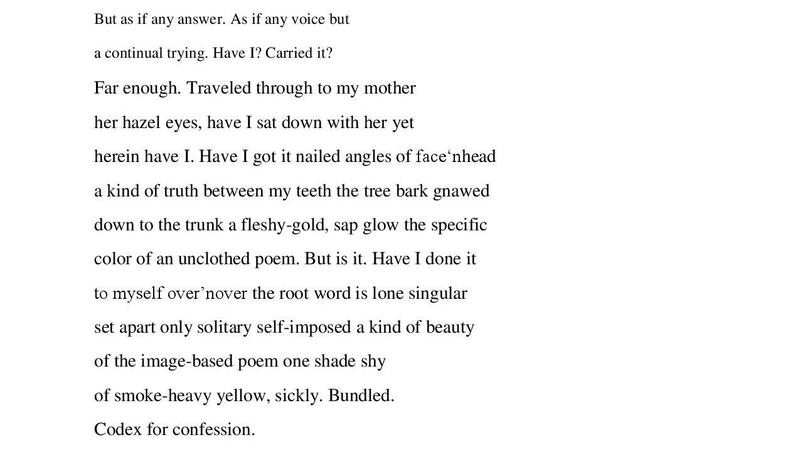 This doesn’t mean that I didn’t work at the poem, but I needed to love what I was writing first, even if at first it didn’t seem so intelligently poetic. What I experienced through this process makes me consider Robert Frost’s “The Figure a Poem Makes,” in which he explains, “It should be of the pleasure of a poem itself to tell how it can. 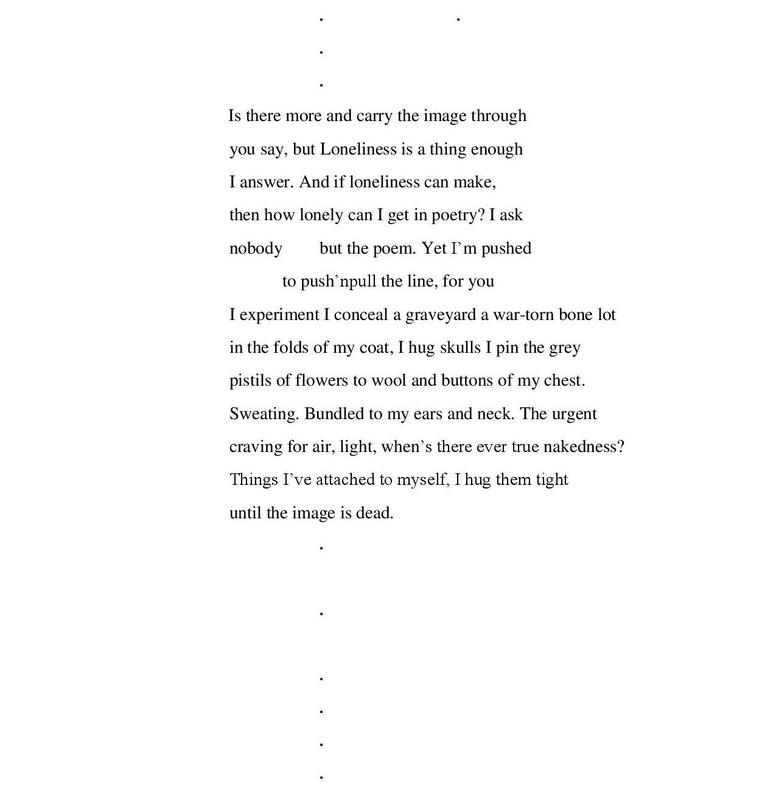 The figure a poem makes. It begins in delight and ends in wisdom.” A small disclaimer: I do not actually enjoy poems that make a direct point, wherein I sense that the writer crafted a poem to teach me a lesson. But I like to interpret Frost’s “wisdom” as an inward clarity felt by the writer, not so much an outward product. 4.) Who are your favorite writers and how did they change over time? Have you been influenced by different genres, and if so how? Early on, I was influenced by short fiction. Most especially, the work of Akutagawa which was introduced to me by IAIA poetry professor, Arthur Sze. In his course, we discussed A Fool’s Life as poems. Indeed, those pages can be read as poems, but they’re something more porous as well. When I first read Akutagawa’s work, I felt like he was my brother. I heard him. His poems said to me, The world is not always round, sometimes it’s the steely razor of a prose block. On the other end of the spectrum, I’ve been influenced by the likes of Aram Saroyan and bpNichol. They said to me, You can do what you want with your words, just be bright about it. Each word in their poems, individually, is a statue on the page, you know? Shapely. 3-D. One of my favorite poems of the moment is by Saroyan. It’s just two black words in the middle of a white page: “I crazy” I read that and I was like, Yes, man, you crazy. And I love it. I always mention Gertrude Stein as a pivotal influence, absolutely. Her writing said to me, Yes and yes and yes and yes and yes. I have also recently been introduced to Russian Conceptualists by Bard professor, Matvei Yankelevich. Last month, I submitted a piece to the Heritage Center on the Pine Ridge Reservation in South Dakota—21 buffalos made out of silver window screen (metal mesh) with accompanying text in each of their bodies. It’s titled, “Buffalo Book” and I consider it more of a publication than a sculptural work. The first buffalo reads, “This is the book I’ve been meaning to write.” The exact connection to Russian Conceptualists may not be apparent, but they were bubbling in my head as I worked. 5.) What are your plans for the future? I really, really hope to continue teaching and working with Native students. It makes me happy. At the same time, of course, I want to make more art, more poems. Push myself. And one day, secret of secrets, I still want to play guitar and sing something—see if I can really create what I imagine possible with the voice—then make a video and post it on Youtube. I won’t tell anyone, I’ll just upload. Like a message in a bottle of sorts. This is pretty cheezy, but since you asked. 6.) Who are promising women writers to look at in the future? When the opportunity presents itself, I encourage readers to seek out works written by Indigenous women—in the Americas or beyond. Last year, I edited a folio of poetry by Native American women for Drunken Boat [http://www.drunkenboat.com/db15/native-american-women-poets]. Readers might look there or in other recent collections, such as Sing: Indigenous Poetry of the Americas (University of Arizona Press, 2011) or the Winter 2012 issue of Prairie Schooner. When I worked with Drunken Boat, I began to think about ideas of the exotic versus the familiar. With all that’s happening politically, environmentally, and culturally (e.g. the public discourse about what and who is “American”) I believe a time is erupting when the relationship between Native peoples of this country and the dominant society will not be so rocky, silent or abstract. What I mean is, and I risk sounding idealistic, but I hope for a time when more of mainstream America embraces Indigenous communities, cultures and perspectives as part of their own national heritage, their home and sense of belonging. By this, I don’t mean that I hope for non-Native people to begin holding “ceremonies” in their backyards, appropriating cultural practices or laying false claims to Indigenous heritage; these are the toxic goings-on we see when the pendulum swings too far in the other direction. Yet I think of a story I heard about the Maori in New Zealand. In the 1980s a national telephone operator was demoted for answering phone calls with “Kia ora,” a greeting in the Maori language. This case sparked national headlines and debate. Because of public outcry, the operator was returned her job and eventually promoted. And as a result of this public dialogue, “Kia ora” entered everyday use by many New Zealanders, Maori and non-Maori alike. It’s a greeting spoken by airline crews with passengers; it’s the brand name of a national calling card. In the last two decades, the Maori language has surged in growth and revitalization. Canadian linguist Chris Harvey noted that this is an example of how a language of a particular People can become, once again, a language of the land. Not to oversimplify New Zealand’s political/cultural climate, but this story is profound to me because the national perspective changed. I recognize that I’ve strayed into a discussion of Indigenous language which is connected to, yet separate from the conversation about poetry written by Indigenous women—which I recommend as important to the now. But all of this is to make the point that writers of Indigenous heritage come from families who were here before America was called America. I don’t propose this with ego, but in consideration of their perspectives. Thus, literature by Indigenous writers, for the interested reader, may enrich an understanding and connection to this place and time we’re in, collectively. I should note here, as well, that contemporary works by Native writers are not always easy reads, nor wide windows for cultural voyeurism, nor overly fraught with iconic Native American imagery. These days, readers will encounter diverse approaches—poems that are spare or supple or modern or surreal or narrative or fragmented. And so on. Kazim Ali wrote in a Q & A for the Poetry Society of America, “What we really need, every American poet, are forms and approaches and languages […] that hold within them the voices of alterity, the parallels of experience, are lyric and narrative forms that embrace and present new possibilities of understanding America and American experiences.” So one might turn to Inupiaq poet Joan Kane in her poem “Mother Tongues,” as language of the land constructs her understanding of mother, woman, timing, relationships: “By fix / Of milk in saltwater, / Blood in milk. Our / Division of phrase / From fact. Mother, / Aakaa; Woman, / Agnaq. Already / In naming my sons, / You foresee the last time / We will be able to talk / Together—I, daughterless, / And you, who knew?” Or watch Muscogee poet Jennifer Foerster hold her foot on the gas pedal through this “American Coma,” with “the musk of blood on my t-shirt as I drive away, /all smoke and sooty desert in my rearview. / That it’s not the fantasy of a land / that survives / but its rocks, redwoods, ghosts, / armadillos crushed in roadside gutters through Texas.” For me, it would be ideal if literature written by Native women were not a touchstone for the exotic or unusual or nostalgic pleasure—but if their voices became part of the familiar, everyday literary conversation. 7.) In your poem “Burial Flight,” form, explosive sound, and proximity become aggressively domestic. We hear passages such as “father to mother one to un-other/” “this man his chest sways and rocks” “it’s in him it’s what does not happen.” Passages such as “buck shot” “kick jab” mirror the smallness of space between the toes of bird resting on a branch. Our experience is scattered in decimation and delicacy; the slow of a glance, ripped and wrapped in connective tissue. Can you please describe how you use form to reflect motion in the stillness of an image? How does this open the logopoeia of the poem as it confers with domesticity and violence? It’s interesting that you’d ask me about the form for this poem. This was one of the first poems I wrote in which the form came first. Before any words were set to page, I knew what I wanted it to look like. So to a certain degree, the form determined the content (in contrast to Charles Olson’s “Projective Verse,” proposing that content determines form). I wrote “Burial Flight” as a response to a poem by Mark Turcotte titled, “A Blur of Echoes.” Mark’s reading of this poem deeply affected me. It was about the loss of his baby during childbirth. After the reading, we talked about the impact on the mother and on him, as a father. Back then, I’d written like a million poems about motherhood and the female experience of childbirth and his poem made me consider the father, the male connection to children. 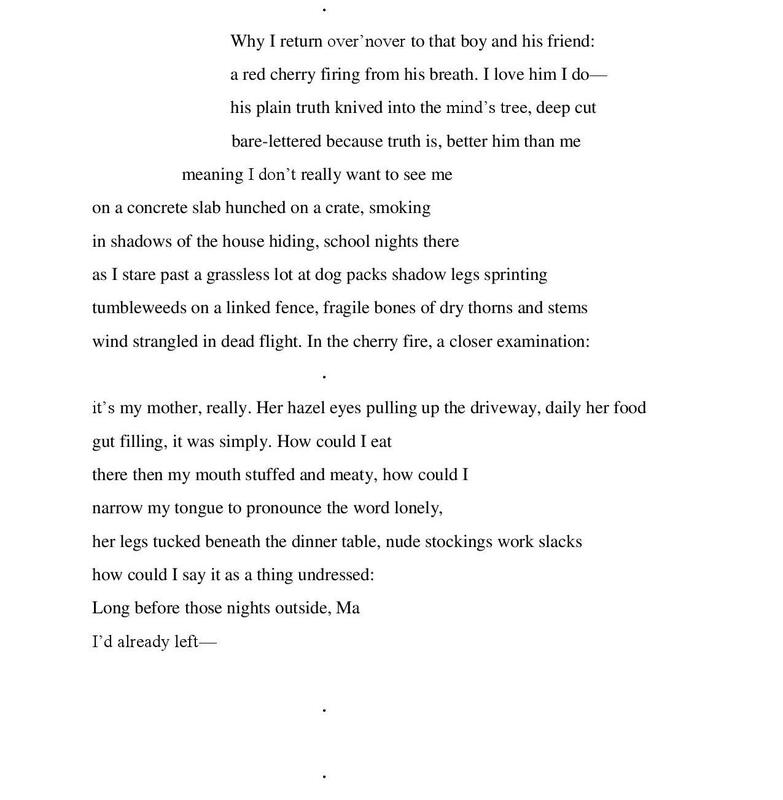 In Mark’s case, I couldn’t imagine losing a child at full-term… the terrible “buckshot blow.” The repeated imagery of birds in “A Blur of Echoes” shook me for weeks—so when I sat down to respond, I knew I wanted my poem to look like a flock of birds in flight across the page. In the end, I don’t know if the form easily translates as birds (ha ha) but that was my intention. Thus, the spacing and phrasing. To my delight, the small phrases enacted the delicacy of pregnancy, a baby, and that small bird’s flight beyond to join “a speck flock.” Yet it’s the caesura between phrases, I believe, that lends a stillness to the imagery, as you mentioned. After reading this poem out loud, I also experienced a violence in the silence of the caesura that almost transcended any imagery in the language. In addition, each phrase needed to be small/brief, so this determined word choice: many one or two-syllable words; language that harnessed specifics of a child(hood), the home, birds, loss; language that opened, not defined, the space for difficult emotional and spiritual territory. This shaped the logopoeia and, I believe, the melopoeia of the poem as well. 8.) How we are able to identify the melodic tone of our bodies converses and dislodges interpretation. In “Edge,” the pronoun “you,” is a simplicity at once rich and bare. We move from “I am called mommy,” to “you in the rear view mirror back center my love.” And finally “the word for you is little … And I see it I Mommy the edge, but do not point.” How is the pronoun “you” used to address simplicity and complexity and how does this interact with the slim imagery of this piece? Here “Indian or Red Indian” becomes “outdated” and whiteness remains a fortress impenetrated. White opposes “other”. Our ideologically world conversations are built into our linguistic systems. The “American Dream,” is deliberately hidden in a passive desire to apologize for virulence. In your opinion what does this say about the American persona, our linguistic structure and how power structures affect intimacy in our understanding of difference? Well, first I’d like mention that my approach to this poetic response has been deliberately personal and, so far, I’ve maintained a first person I point-of-view in the narrative prose blocks. I am not a spokesperson for all Native American Peoples and their experiences. Even within my own family, my cousins or sisters or aunties have had vastly different experiences from mine. Nonetheless, they are mine, and I have opened myself up to sharing. Likewise, I feel strongly that the only way to respond to this National Apology, with its generalities and abstract language, is to personalize it. My experiences are not in the distant past, they aren’t abstract; they’re real and within living memory. And because of this personal approach, I’ve been able to avoid speaking about America or Americans in generalizations. I have focused on specific moments, particular events and people—showing, not telling, what has shaped my living. Hopefully, readers may take from these pieces whatever resonates for them; that they may witness but not leave the poems feeling condemned. But the other thing I want to mention is that I have avoided the term “White” and working directly with the subject of White America. This is for several reasons, but maybe the most important is that mainstream American society (as in non-Indigenous) is not all White. America is diverse, many peoples of different colors and heritages. Yet, whatever background Americans come from, many stumble over the fix or conundrum of what language/terms to use to refer to the Native Peoples of this country. Indian? Red Indian? American Indian? Even I, as you may have noticed, interchange Native with Native American with Indigenous. It’s a mess. But in all fairness, as you point out, the heart of the problem lies in the language we are working with: English. And yes, therein, is the power structure. Because, in my opinion, if we were really fair and just, Americans would refer to Native Peoples with the terms we use for ourselves, in our own languages. Let me backtrack, and say that I understand there are conversations which require a collective term for all Indigenous people here in America. For example, a statement such as, “President Obama issued an apology to Native Americans in 2009.” However, it would be a giant, positive leap forward if the particulars of our heritage(s) were more widely acknowledged. This gap is the “languageness” I refer to in the poem. Here’s another way to explain it—concerning relationships and “otherness.” In my experience, when I am with Native Americans, the terms Native, Native American, Indian, Indigenous, in many cases, become obsolete. If I were to meet a Hopi woman, for example, we’d introduce ourselves with who we are, where we come from. If I were to say to her, in general terms, “I’m a Native American,” without a specific tribal affiliation, she’d likely think, “But who are you?” If I say, “I am Oglala Lakota,” this establishes geography, history, community and family for both of us. My inner compass shifts, I feel centered, I feel acknowledged. She and I are not the same; we remain an “other” to each other in some manner; but acknowledging our differences is a gesture of respect. Between us, there’s a refusal to accept the generality; we ask for and expect the specific. Immediately, this particular way of relating to one another, engenders a degree of intimacy.